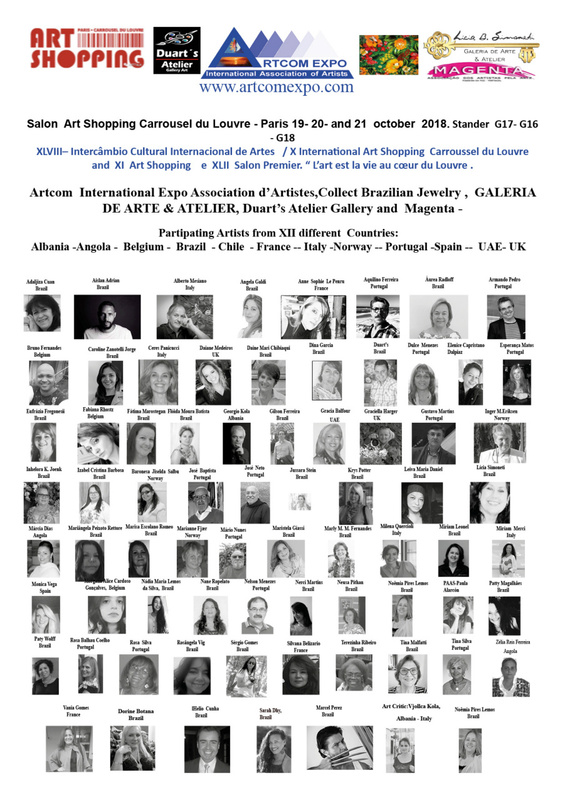 Artcom International Expo Association and d'Artistes, Duart's Atelier Gallery Master of the Workshop Masters by Mercosur and Magenta -Portugal. "Crossing Continents". "L'art est l'expresion is the most pure for the presentation of the unconscious of chacun. C'est la liberté de l'expression, c'est la sensibilité, c'est la créativité, c'est la vie. 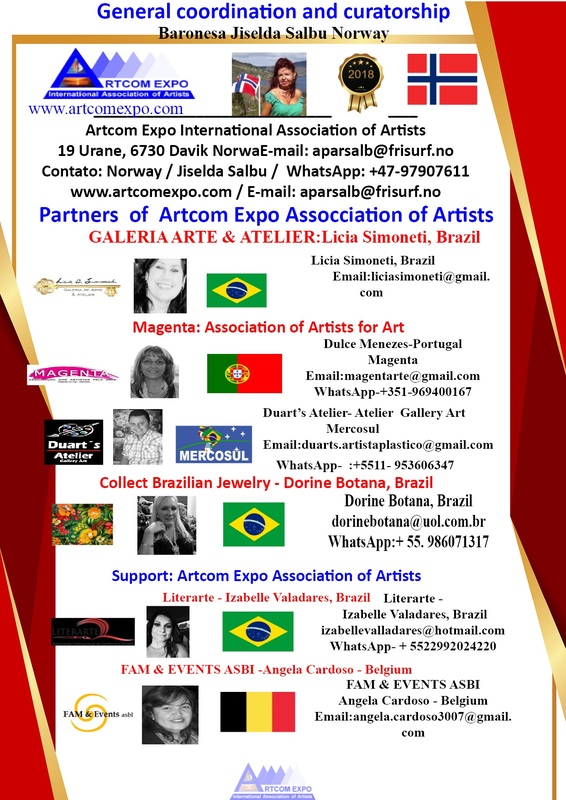 Our main objective is to establish the dissemination of Artists from the Countries listed above, taking their works to Europe through Artcom Expo International Cultural - Scandinavia - Europe - Latin America - With the partnership of Duart's Atelier Gallery in Brazil and Magenta in Portugal. 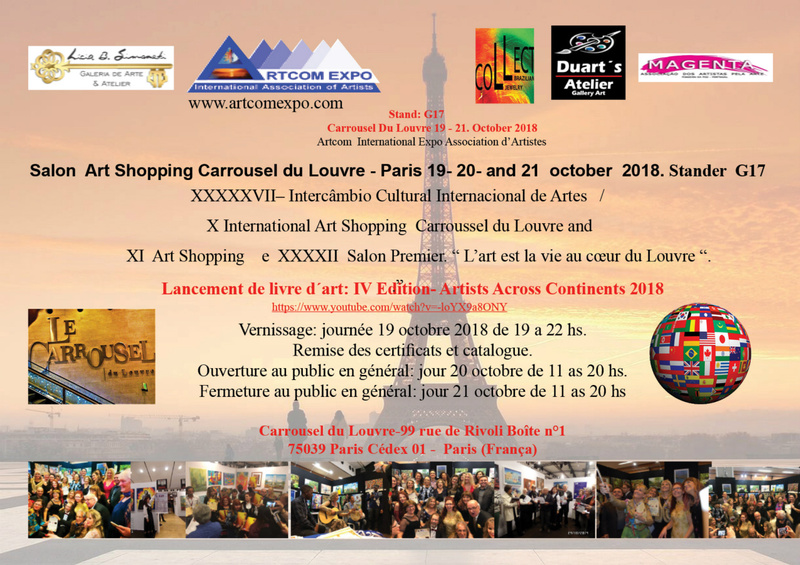 Art Fairs - Carrousel du Louvre: 19/20 and 21 October 2018. Opening: Delivery of Certificates, Awards and Virtual Catalog. Assembly: Day 19 - 12pm can deliver the works on the spot the artists present. Closing of the Exhibition: October 21 at 6 pm, and those who want to remove their work will have no problems. 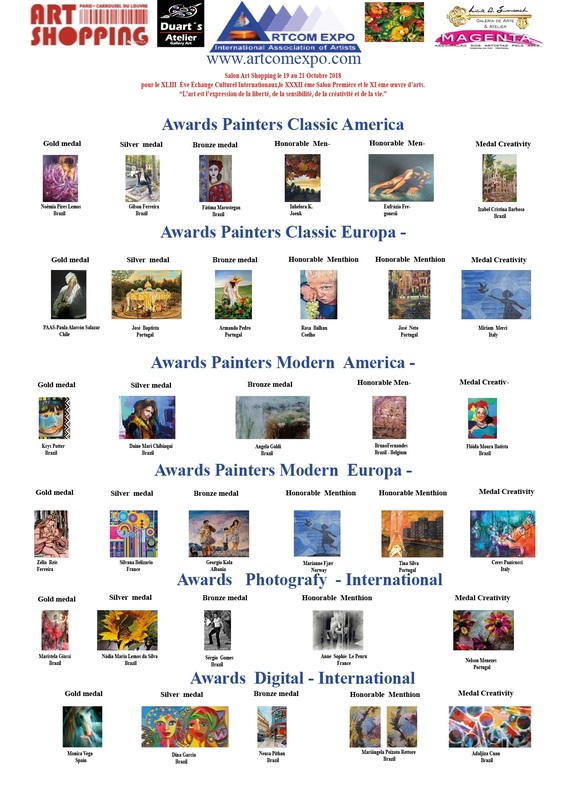 We inform you that the smaller works are the ones that are best sold in this Hall. We suggest that the sales prices do not exceed 1,500 EUROS. The works can not exceed the measure. Sculpture up to: 0,60 x 0,40 x, ​​060. I will send you the files with the IPHAN document, those that already have them. Dates of the payments of the two remaining installments? 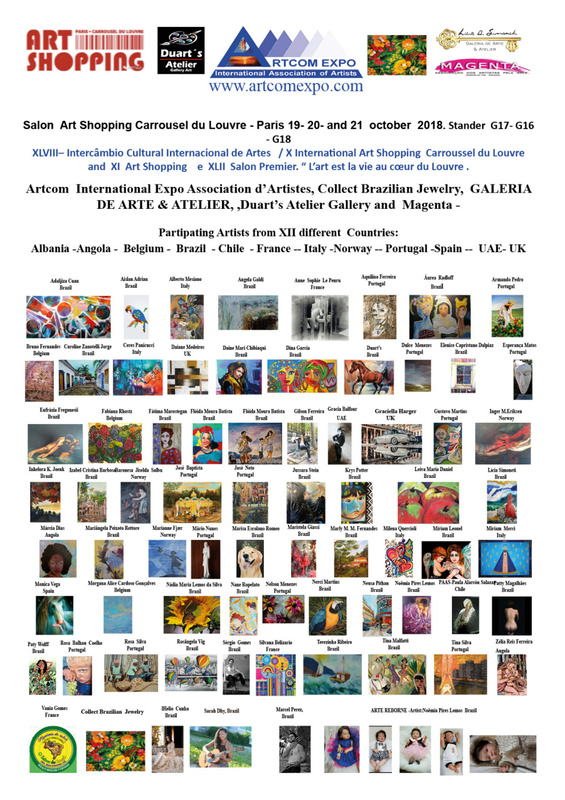 Will you be present at the vernissage? Send this form until September 7, 2018. Date of withdrawal of the work: personally on the last day of the exhibition, or the curator will send by mail for payment in advance. Artcom International Expo Association et d’Artistes, Duart's Atelier Gallery, Gallery Art Lícia B.Simoneti and Magenta -Portugal. 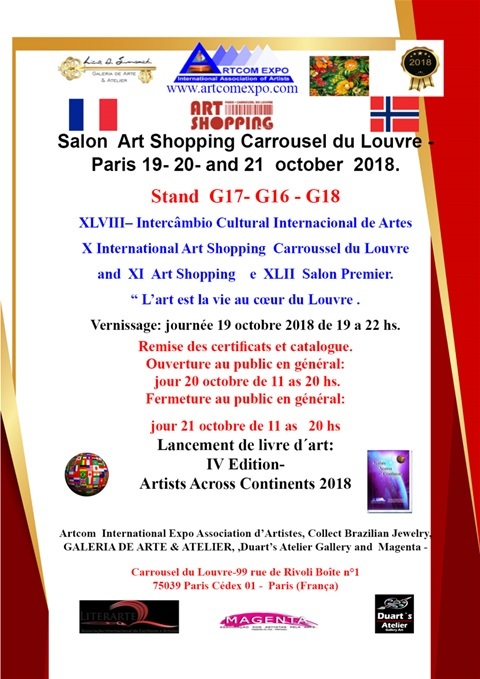 Salon Art Shopping Carrousel du Louvre - Paris 19- 20- and 21 october 2018.
and IX Art Shopping Carroussel du Louvre 2018. 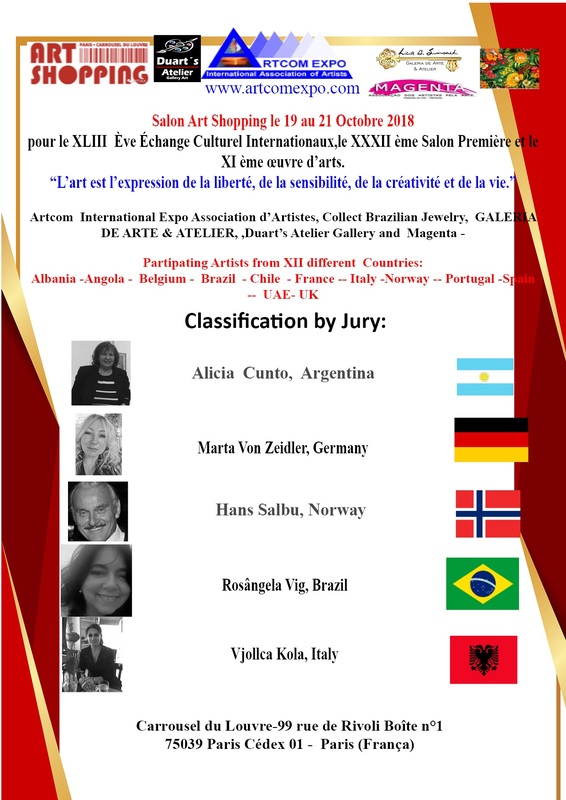 XXXXII Salon Premier-“ Art is life in the heart of the Louvre”. First launch of the Book Artists Across Continents IV Edition 2018. Award Winning Salon. 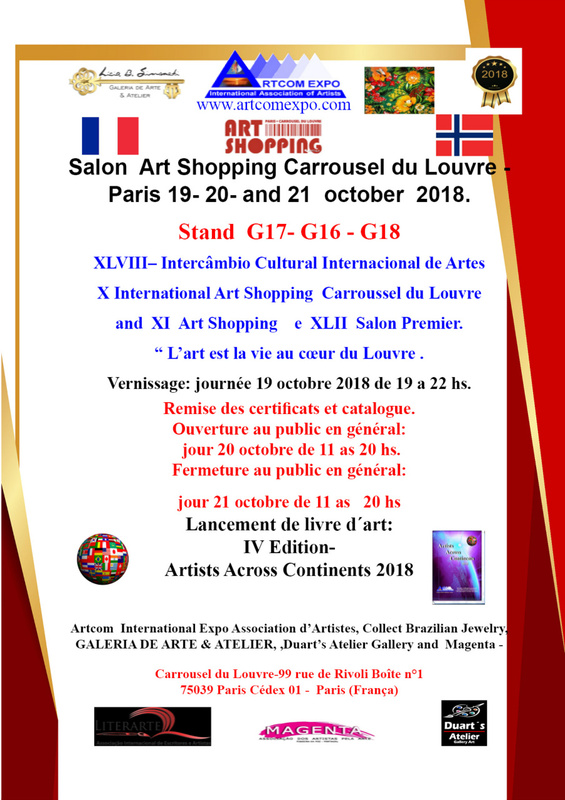 Feiras de Arte - Carrousel du Louvre : 19/ 20 e 21 de Outubro 2018. Montagem: Dia 19- as 12 horas pode entregar as obras no local os artistas presentes . Encerramento da Mostra: Dia 21 de Outubro as 18 horas,e os mesmos que queram retirar a sua obra não havera problemas. Price : 600 Euros membros ///// Nao membros 700 Euros. 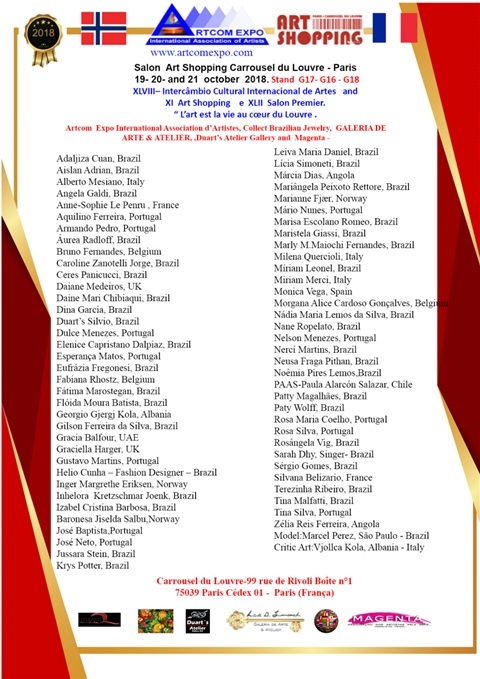 As inscriçãos abertas a todos os artistas interessados de 01-01-2018 , ate 07 de setembro 2018. Mandarem as fichas junto com o documento do IPHAN, aqueles que ja tiverem. Enviar essa ficha até dia 07 de Setembro 2018 . “ L’art est la vie au cœur du Louvre . 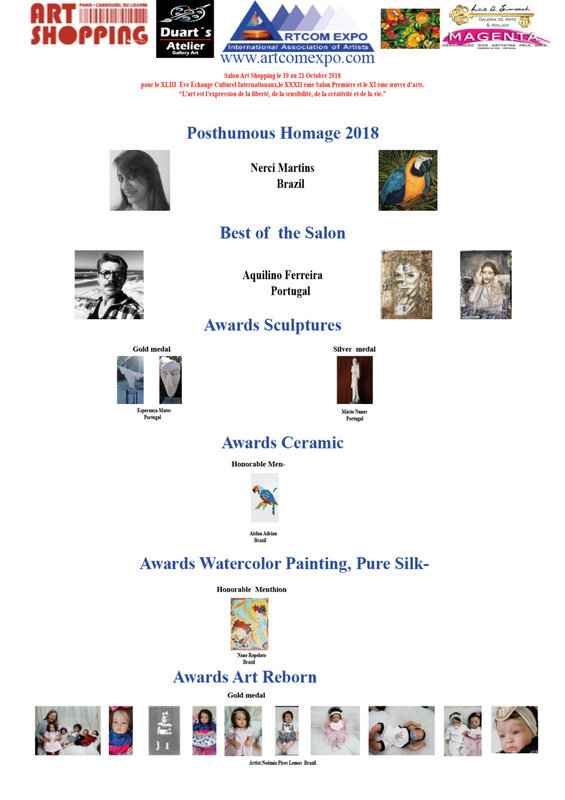 Vernissage: journée 19 octobre 2018 de 19 a 22 hs. Remise des certificats et catalogue. Ouverture au public en général: jour 20 octobre de 11 as 20 hs.